Whether it’s snowing where you live or dry as a bone, celebrating the Christmas season with lights is pretty much a universal thing. And while we all know that one Clark Griswold neighbor near us who goes all out every year, he’s nothing compared to some of the huge light displays we found. With miles of twinkly lights, singing snowmen and two-story-tall Kris Kringles, these neighborhoods are hard to beat and totally worth the trouble to see them. Bundle up kids, because you ‘aint seen anything like these Candy Cane Lanes. More than one million Christmas lights will be displayed over 15 acres at Warm Beach Camp in Stanwood, WA (20800 Marine Dr.) The Lights of Christmas is the largest holiday light display in the Pacific Northwest and includes live entertainment, children’s activities, food, holiday shopping and more. In addition, reservations can be made for Overnight accommodations in holiday-themed lodges and for Dinner Theatre and Sunday Dessert Matinee. The lights will be on from 5-10 p.m. Nov. 29-Dec. 2, 6-9, 13-16, 19-23, and 26-29. Tickets range from $12-16 but special “pay what you can afford nights” will be offered on Nov. 29, Dec. 6, 27 and 28. Find more sweet spots in Seattle here. Featuring live music and over-the-top Christmas decorating, Wakefield Court’s Winter Wonderland keeps the lights on nightly from Sun. Nov. 25 until Fri. Dec. 30 from 5:30-10:30 p.m. With over 40 homes taking part this neighborhood, it's pretty popular, and with a wait of over an hour at times it’s a great idea to park and enjoy a brisk winter walk while oohing and aahing over the displays. Adding meaning to the season, there is a charity toy dropoff near where the band plays. Wakefield Court is located in Saugus, CA. Check out more of the best lights Los Angeles has to offer here. Find more dazzling displays in Washington D.C. here. The whole block between High and Fernside on Thompson Avenue in Alameda is home to Christmas Tree Lane which is one of the most festive spots in all of the Bay Area. Friendly folks out for viewing parties, beautiful lights, and even a tap-dancing tree or two (we swear!). The lights will be on Sat. Dec. 1 through New Year's Eve! And Santa will be there, weather permitting, every night from Dec. 8-22 from 6:30-8:00 p.m.
Find all of the Bay Area's best spots by clicking here. Peacock Lane has been a Portland tradition since the 1920s. Located between SE Stark Street and Belmont Street & one block East of Cesar Chavez/SE 39th, this row of beautiful Tudor-style homes shine from Dec. 15-31 from 6-11 p.m. Not only will you find beautiful sparkling lights, but also nativity scenes, rotating Christmas trees and stunningly life-like replicas of Santa and Frosty. Since this is pretty popular, Dec. 15-17 have been designated “pedestrian only” nights. Find the prettiest lights in all of Portland here. When thinking about how to describe the holiday light displays in the southwest Brooklyn neighborhood of Dyker Heights, “totally” and “awesome” hit the nail on the head. Residents are always engaged in friendly competition to out-dazzle each other, so homes here are decked out with two-story-high toy soldiers and Santas, mannequins enacting holiday scenes, armies of oversized inflatables, and yes, lights. Lots and lots of lights. Book a tour with a local Brooklynite or brave the crowds on your own. Best streets to stroll include 83rd through 86th Sts. and 11-13th Aves. Grab all the holiday displays in New York here. Located in Tierrasanta at 5306 Belado Dr., this one-house masterpiece is truly a must-see. Belardo Lights started in 2006 as a way for the Schimka family to give their two autistic sons, Brandon and Stephen, their very own light show for the holidays. This labor of love has more than 100,000 lights, is a heartwarming tradition for many families and continues to be an anxiously anticipated event each holiday season. Turn your car radio to 106.1 FM to hear the holiday music played in sync with the lights. Discover other SoCal spots to see light here. A Seattle institution since 1949, Candy Cane Lane (otherwise known as NE Park Road, just off the main drag of Ravenna Boulevard at the cross street of 21st Avenue NE, just north of U Village) is actually a curved row of 23 adorably decorated houses—mostly 1920s-era Tudors that are so sweet they look like you could have plucked them right off a gingerbread house display. Be on the lookout for the big guy in red; he can be found handing out candy canes to the brave (and well bundled!) bunches out for a stroll. 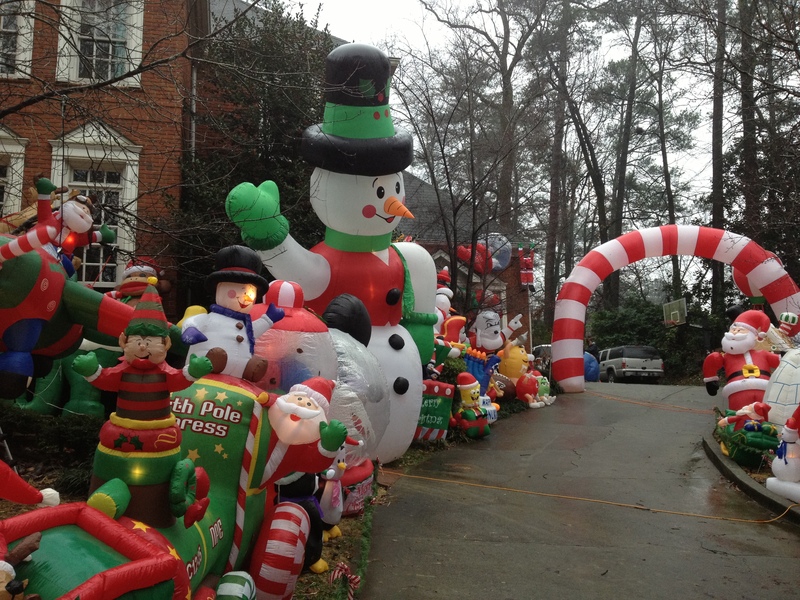 Home to several impressive displays, this historic Atlanta neighborhood deserves a look. A local favorite at the corner of Winall and Peachtree Dunwoody shines the brightest. Using hundreds of light-up inflatables, this spot is totally worth any potential late-night meltdowns from little passengers. Admission to the wow-worthy display is free but for a cause; visitors can purchase baked goods or make a donation to benefit The Genesis Shelter, a women’s shelter. Find more amazing Atlanta spots here. Your best bet for awesome is near Mockingbird, along Armstrong & Preston, where giant pecan trees glitter with lights and old historic homes are decked out with professional quality light shows. The best part? This neighborhood has taken a back seat to the more popular Interlochen in Arlington—which means way fewer crowds and tons of snap-worthy spots. There are several carriage services to choose from, be sure to BYOC (that’s hot chocolate to you) and don’t forget some carrots for that pony up front. Every year, families revel in the annual Illuminations Tour by way of a trolley car in Sommerville. Each house adds its own artistic spin on the decorations—you’ll even catch a glimpse of an animatronic elf or two. The 45-minute trolley tour leaves from the Somerville High School Field House where you’ll find hot coffee, hot chocolate and cookies not to mention craft activities for the kids. This year’s tour will take place on Dec. 15 with trollies leaving at 4:30, 5:00, 5:45, 6:15, 7:00, 7:30, 8:15, 8:45. 9:15. As a fundraiser for the Arts Council, tickets to the event are $15/adults and $8/kids age 12 and under as well as seniors age 65 or better! Tickets can be purchased by visiting the Sommerville Arts Council website. All the houses glitter in this Denver neighborhood but the ones on W. White Oak Lane are the real gems. Cruising by? Tune your radio to 97.7 FM for the holiday music played to the beat the dazzling light show! The community association has an annual house decorating contest and tons of other holiday happenings throughout the season, so there is lots of cheer and good to be had. From November 23 to December 30, Enchant Christmas will light up the Arlington’s skies with bright lights inside Globe Life Park (1000 Ballpark Way). Unwrap new traditions and make memories as you explore the World’s Largest Christmas Light Maze, glide across the ice skating trail, visit Santa & Mrs. Claus, take in the cheer of live entertainment, and more as you’re sure to find enchantment around every corner. Enchant Christmas will be held Nov. 23 through Dec. 30, 2018, and yes, it will even be open on Christmas Eve and Christmas Day (however, it will be closed on Nov. 26, Dec. 3 & Dec. 10). Good to know: While tickets will be available to purchase at the on-site ticket booth, it is highly recommended that you purchase your tickets online ahead of time as they could run out on the date you choose to attend. Williamson County’s only drive-thru display will illuminate for the first time this Nov. 22–Dec. 29 for the Franktown Festival of Lights. This new tradition (hence, no photo!) will be located at the Williamson County Ag Center, viewings will be available nightly from 6-10 p.m. The $25-per-car ticket will help support inner-city youth through Franktown Open Hearts. Tickets can be purchased here. This year marks the 31st annual Christmas in the Park, a favorite yuletide attraction for many families and with good reason. Held at the Frank White Jr. Softball Complex (3901 SW Longview Road), this event boasts of over 300,000 lights and 175 animated displays. Admission is free, but donations are gladly accepted and will go toward 35 local charities, so it’s a win-win for everyone! (Since 1987, the events has raised over $1 million in donations!) Christmas in the park runs from Nov. 21 – Dec. 31, 2018. Hours are 5:30-10 p.m. Sun.-Thur. and 5:30-11 p.m. Fri.-Sat. Featured in both Midwest Living and Ohio Magazine, the Clifton Mill Legendary Lights has been known as one of the country’s best light displays for 30 years. Located at 75 Water St., over 3.5 million lights illuminate the mill, gorge, riverbanks, trees and bridges. There's even a 100-foot “waterfall” of twinkling lights! Don’t miss the miniature village, the Santa Claus Museum, the large toy collection and a spectacular synchronized lights and music show that features the old Covered Bridge. The lights come on every night at 6 p.m. and shut down at 9 p.m. (except for Christmas Eve, Christmas and New Year’s Eve in which they close at 8:00 p.m.) from Nov. 23 – Dec. 31, 2018. Tickets are $10 a person, and kids age 6 & under get in free.